WordPress - an open source powerful PHP platform to develop personal web blogs, WordPress is the most used blog system at present, and I also opened a personal blog base this platform recently. In this tutorial, I'm going to show you the best way to do that. Firstly, since WordPress 2.6, the user can move the wp-content directory wherever he wants. What does that mean? That's right: instant plugin breakage. Secondly, if the user installs another plugin that also uses jQuery, the page will end up with jQuery being loaded twice. That's an obvious improvement. But what if the shortcode appears on a single page? You're needlessly including a file 99% of the time, causing slower page loads. Notice that in the last two examples, we've been using the template_redirect action. The trouble with wp_enqueue_script() is that you have to call it before wp_head() fires. So, before the page is rendered, you have to decide if you should add your script or not. Not an easy call to make, is it? Well, there's a secret method that will let you enqueue scripts after the entire page has been displayed. In this case, the script will be enqueued only if the $add_my_script global was set at some point during the rendering of the page. 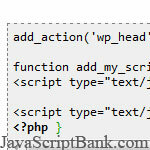 The key here is that you're calling $wp_scripts directly, instead of relying on WordPress to do it for you. It will still check if jQuery was already enqueued or not. So, the script will be added if [myshortcode ...] was found in any of the posts on the current page. I hope this tutorial has helped you on your way to mastering WordPress script loading.